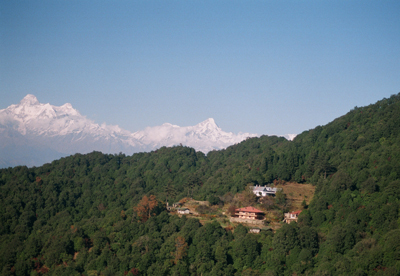 In the heart of virgin wilderness surrounded by oak and rhododendron forest, with the sweeping views of the Himalayan ranges.. come to the Binsar Retreat. 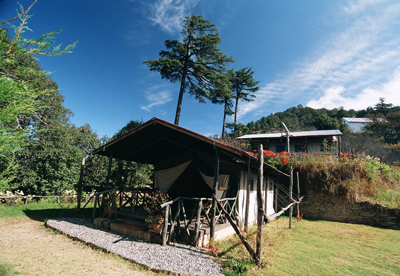 Located in the middle of Binsar Sanctuary at an altitude of 7,500 ft, the retreat comprises five luxury tents set in spacious private gardens with polished wood floors, handcrafted wooden furniture and beautiful traditional textiles and furnishings. Each tent is equipped with eco-friendly solar lighting and heating besides facilities like modern bathrooms. 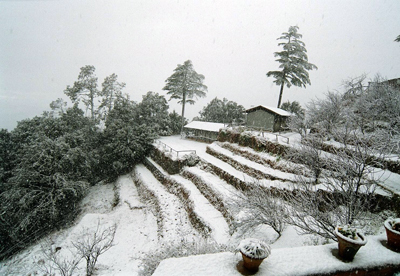 The Binsar Retreat provides wholesome and nutritious meals with a variety of traditional Kumauni, Indian and Continental cuisine including homemade bread, diary products and jams. Picnic hampers are provided for day treks and trips in and around the sanctuary. – Walk through the core area of the Binsar Sanctuary with guides on trails through dense forest filed with over two hundred species of resident and migratory birds and wild life such as leopard, barking deer, ghoral, wild boar, pine marten fox, porcupine and langoor Monkey. – Trek from Binsar to the famous Jyotrilinga temple of Jageshwar (20 Kms. ), Viridha Jageshwar (18 Kms.) and the shrine of Gannath (20Kms.) with picnic lunch and return to the Retreat by a four-wheel drive vehicle.